After seeing a few "food pyramids" floating around online recently, it reminded me that I wanted to blog about how I think a breastfeeding support system should work. Not an obvious link and perhaps a tad narcissistic you might think, probably but hey ho what's the point of a blog anyway if not a personal soap box? Firstly I should quickly cover "breastfeeding titles" again, for those not familiar with the basics there is an outline here. It needs editing as it's rather long (which I'm sure I will get around to doing at some point in the next decade), but scroll down to "Titles and what they mean" for a quick summary. 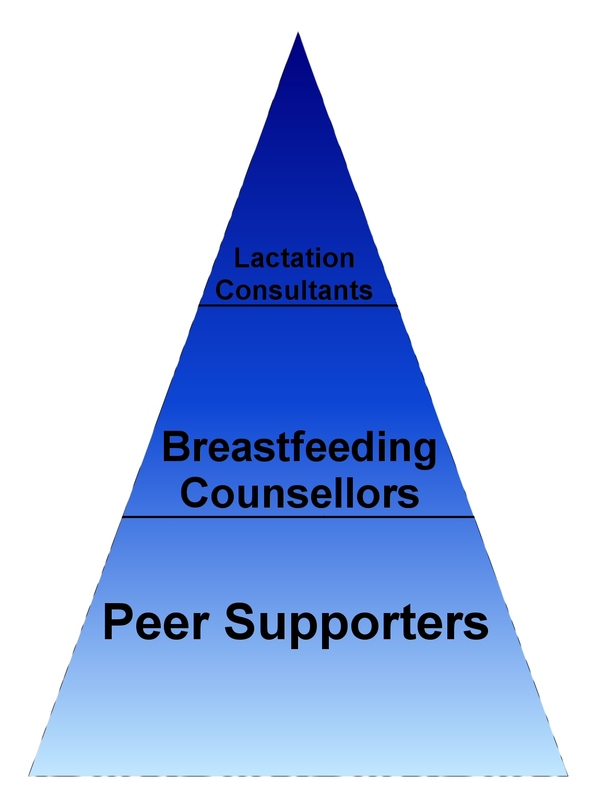 For ease in this post I use the terms peer supporter, breastfeeding counsellor and lactation consultants to differentiate between different types of support, but in practise as the above post discusses there are lots of different titles and lots of grey areas. But let's keep it simple. OK so technically it's a triangle, not a pyramid - but you get the idea. Peer supporters (PS): make up the biggest chunk of the triangle. We need loads of them, because lots of people don't have a friend, sister or aunt who breastfed and who can help with what is and isn't typical. Perhaps suggest different positions (help with biological nurturing ;)) share tips and tricks that worked for them, explain cluster feeding and why the breast is a whole lot more than food - on a truly peer level, a friend and equal mum can relate to. The peer supporter should also be able to identify when there is a problem beyond the basic normal new baby stuff and help mum access support to help to resolve it. This is where it sometimes gets tricky as if we want to help, often the instinct is to dive on in, try to problem solve and "fix". I feel it's really important peer supporters don't head in to this territory, because it completely shifts the whole dynamic of the relationship from peer to problem solver. Plus of course the risk that without further training, a mistake is made. As just one example, I meet mums who are told to block feed because the green nappies must mean too much lactose. However this is a technique to reduce supply and so if this isn't the reason, problems can quickly become more significant, even if intentions were good. Mum then gets conflicting advice from different people, which can serve to demoralise her further and soon she is unsure who to trust. I work with several doulas who are peer supporters and the best feedback always comes from those who are the cheerleaders. When mums feel truly supported this is absolutely as important as getting the right "technical help", if not more so at times. Those who are encouraging, supportive "you can do this! ", "lots of mums experience this but we'll get you hooked up with someone that can help and then I will stick around to help you implement stuff, bounce any concerns off, tell you how fab you're doing!" are truly valued. Breastfeeding Counsellor (BFC): A peer supporter with a problem should have people trained to breastfeeding counsellor level that she can refer to. 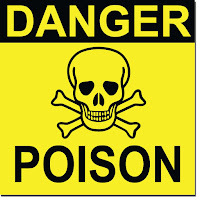 A BFC can handle a large percentage of the concerns that will arise daily in the community. Training includes the counselling skills to allow a mum to explore problems in a safe non judgemental space, so that together they can find a path forward that works for both mum and baby. All breastfeeding counsellors should have in my opinion, basic training to spot the signs of tongue tie. This doesn't mean lots of people rooting about in baby's mouth, but it does mean recognising key symptoms, visual indicators and so on. Lactation Consultant (IBCLC)/Infant Feeding Advisor: If the pyramid below this point is functioning well with appropriately trained staff, we shouldn't actually need lots of IBCLC's for things to work well. It also means IBCLC's are being best utilised dealing with more complex cases, and not doing things PS's or BFC's can do perfectly well. These are typically what I would call clinical or more complex cases like weight gain issues, tongue ties, babies who are very disorganised or unable to latch at all, perhaps under consultant care for reflux or suchlike, premature babies and so on. An IBCLC can help make a care plan to move forward and communicate with other health professionals involved in care. All should be capable of identifying both obvious and posterior tongue ties and furthermore whether the tie is the cause of the problem. Referring up the pyramid does not mean care ceases from lower down - on the contrary continued collaborative working is key. An example might be tongue tie referred to IBCLC, an appropriately trained/experienced BFC might take over aftercare alongside support from PS once everyone is sure the procedure has been successful and symptoms are improving. The BFC can go back to the IBCLC at any point, or if all is well the PS can take over entirely. But what my eyes and brain tell me in practise is that it's not only false economy, but also not truly supportive or at times even adequate. Infant feeding is the cornerstone of health, yet we have voluntary organisations propping up the entire system! If all were to close tomorrow and all volunteers were to leave - what do we think would happen to breastfeeding rates in the UK? The thousands of calls per year to the those organisation paints a clear picture - parents not only need appropriately qualified help, but they need it at the right time to have a chance to succeed. My breastfeeding journey truly began with dim memories of my mom nursing my baby brothers; but as an adult, I was heavily influenced by a friend who had her twins a few months before I had my eldest. She fed her babies without batting an eye - there was no discussion of "if I can do it" or whatnot. She just did it because that's what you do. I absorbed that attitude (drank it in, more likely) and it became my own attitude when my baby was born. I'm 30 weeks along with my fifth and am still very grateful for her influence! Brilliant article and also really helpful to me as a peer supporter, to have that role clarified. I often worry that my knowledge is inadequate because I can't "solve" every problem, but of course, i don't need to. Hey, I nominated you for the one lovely blog award because I love your lovely blog, I keep coming back to it and just wanted to share that! !